Lombardi is lit from within by a radiant, uproariously wiseacre performance from the lone female on the premises—Judith Light as Lombardi's Jersey-tough ever-lovin', Marie. It's no mean achievement, stealing the show with a wifely perspective, but she has been armed with a full quiver of zingers, and her flinty, deflective quips prove the perfect, deflating foil for Lauria's bombastic outbursts. "I love her," Light admitted, arriving glamorously transformed for the after-party. "She's strong! She's powerful! She is inspired by someone else's vision—her husband's—and she really devotes herself to supporting him having that vision, and what that does is that her support of him took that team up to another level. "She passed in 1982, 12 years after he died. She smoked, and she was a very heavy smoker. We don't do a lot of that in the play—for obvious reasons: We don't want to take that out on the audience in any way—but she died of lung cancer." And not hepatitis? Light is discovered with a drink in her hand and rarely puts it down after that. "I haven't counted the drinks I have every evening, so don't make me count. Actually, it's all water and ice tea." Her precise comic timing is obviously intact, but the illusion of booze fuels the character's jaundice and caustic one-liners. Director Kail confessed he got this job through The New York Times. "I happen to read the sports section before I read the arts section every day," he said, rather proudly for a Tony nominee. "Richard Sandomir wrote an article last November, and I emailed my agent and said, 'Look, I don't know who else is going to go in and meet on this, but I'd love to go meet Fran and Tony. I sat down with them and got to talk to them and the playwright, and I started working on it in January." Kail came to directing as "a failed athlete who took up coaching. Coaching and directing have always been very related to me. There are a lot of parallels. I felt like this was a chance to explore what I do while investigating Coach Lombardi's life." There was no problem adjusting to the in-the-round demands of Circle in the Square; if anything, the theatre gave off the proper vibes of a football stadium, with the action centrally focused and scenery rising up out of the floor for scene changes. "We actually had a proscenium when we did it out of town," Kail recalled, "so what we had a chance to do was explore the play, rehearse the play, work on the play—but we had to do a completely different physical production when we came to Broadway. We obviously learned a lot in that first process. We took some things with us and had to throw some of the things out. I enjoyed working in the round. "First of all, we had a play that fit perfectly in that space. 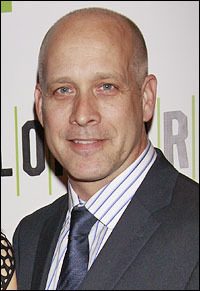 Then we had a playwright—Eric Simonson—who has directed dozens of plays and is a very easy collaborator. When I go in and say, 'Hey, I feel like maybe this could be a shaft of light, enough to bring this up again,' he says, 'Great. Shaft of light.' So that allowed it to be fluid and to keep the momentum of the play going. Eric wrote a beautiful play, and we have six terrific actors who know how to tell the truth—and, when they tell the truth like that, you get those laughs and you get those other moments too when you feel that heartbreak, and I think that's a testament to them." In the past 20 years, Simonson has been on Broadway three times, all in different capacities—first as an actor, doubling as a ranch bookkeeper and a car salesman, in 1990's The Grapes of Wrath; then as a director—and a Tony-nominated one—of 1993's The Song of Jacob Zulu, and now as a playwright. He has a couple of commissioned plays on the back burner; if these don't work out, he can always be Prop Master since all he needs is another profession to join the rarefied Renaissance company of Orson Welles, who did all those jobs and produced on Broadway, too. A wry grin cracked Simonson's flatline persona at the suggestion of such a lofty association. His buttoned-down demeanor doesn't hint at the humor he has generously pumped into this play. A native of Wisconsin, he is not above self-depreciation—like the moment Marie breaks out the atlas to locate Green Bay. Lombardi's daughter, Susan, led the parade of sports figures mixing and mingling with all the usual first-night suspects—such theatrical irregulars as NFL Commissioner Roger Goodell with wife Florence, Green Bay Packers CEO Mark Murphy, New York Giants co-owners John Mara and Jonathan Tisch, Lombardi biographer Maraniss and former New York Yankee Lee Mazzilli. Although former Green Bay Packers Chuck Mercein didn't make the play's cut, he did show up for its premiere. It was his second viewing, and he had praise for Lauria and Light. His words: "Absolutely excellent. They really nail those parts." Lin-Manuel Miranda, with the new Mrs. (Vanessa), and Priscilla Lopez showed up in support of their In the Heights director, Kail. Tyne Daly, who's bracing for a second workshop of her Broadway-bound Ballroom Nov. 8, flanked Charles Durning and a wheel-chaired Jack Klugman at a table near the entrance of the ballroom. Also: Dan Grimaldi from "The Sopranos," Wendie Malick (returning next week for a second season of "Hot in Cleveland"), Graham Rowat and wife Kate Baldwin, Memphis scribe and lyricist Joe DiPietro, retired Pirate Queen Stephanie J. Block, comedienne Rachel Dratch, "Shooter" star Kate Mara with Max Minghella of "The Social Network," Tony Lo Bianco with wife Elizabeth (his new movie is "The Irishman"—and "I'm not the Irishman!"). A lot of the Light brigade—co-stars of the actress who count themselves as friends—showed up on opening night: Katie Finneran, who played Westport and Williamstown with her in A. R. Gurney's Children; Sarah Paulson, who had her for a mother in Off-Broadway's Colder Than Here (and Lauria for a father in a movie called "The Spirit"); Daryl Roth, who produced her Off-Broadway in Wit (as well as Lauria and Dawes in Ears on a Beatle); and Michael Urie from her Emmy-nominated "Ugly Betty." When someone asked Urie what position he played in high school football, he shot back with "French horn—and I got to see a lot of football games that way, too!" 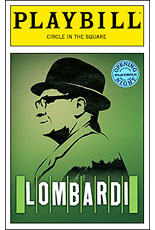 Lombardi, Eric Simonson's biographical sports play that took audiences to the living room, locker room and gridiron of football coach Vince Lombardi, opened at Broadway's Circle in the Square Theatre on Oct. 21, 2010.